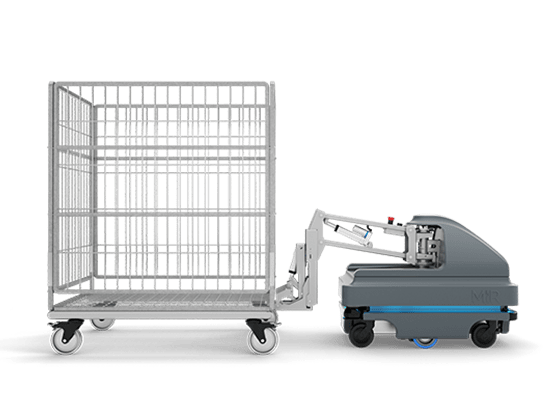 MiRHook200: Automatic Pick-Up and Drop-Off of Carts up to 1100 lbs Payload - Allied Automation, Inc.
Increase the efficiency of internal transportation tasks with an extended-payload MiRHook200 mobile robot. MiRHook200 is a user-friendly and efficient mobile robot for fully automated pick-up and towing of carts in production, logistics and healthcare environments. MiRHook 200 is ideal for a wide range of towing jobs, such as efficiently moving heavy products between locations in a manufacturing facility or warehouse, or moving linen and food carts in hospitals. The MiRHook 200 supports the transport of loads up to 500 kg (1100 lbs), providing exciting new internal logistics options for weighty or unwieldy cargos. The MiRHook 200 robot identifies carts by QR markers and autonomously transports them as you define. MiRHook 200 can be incorporated into a fleet of MiR robots, and can be easily redeployed to meet changing requirements. Updating the robot’s mission at any time is simple, using a smartphone, tablet or computer and standard Wi-Fi or Bluetooth communications to access the robot’s intuitive controls. With the MiRHook 200, you simply measure your cart and feed the data into the software. Built-in sensors, cameras and sophisticated software mean the robot with the MiRHook 200 and a cart can safely maneuver around people and obstacles, and can even drive up ramps.